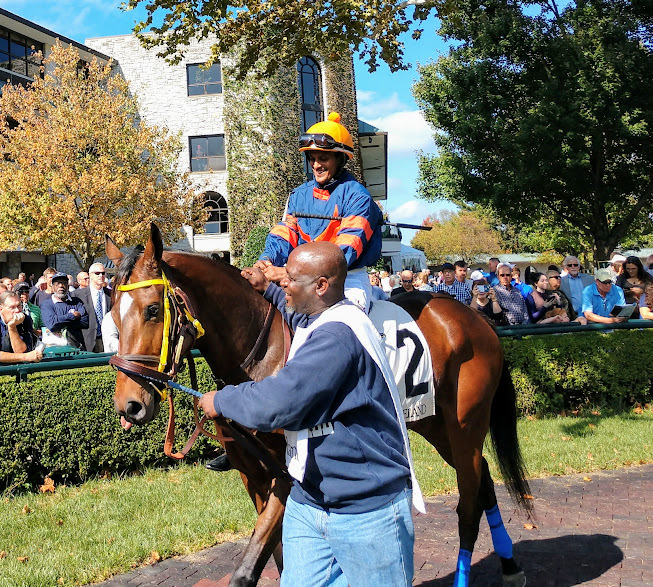 A filly owned by Auburn College of Veterinary Medicine alumnus Dr. Bryan Waldridge ’91 recently won in her inaugural race at Keeneland in Lexington, Kentucky, in something of a Cinderella story. War Eagle’s Love was purchased by Dr. Waldridge last year for just $2,700, and considered to be a longshot. She ran in a claiming race where all the fillies were eligible to be bought, and were non-winners. While Birdie, as she is nicknamed, is nominated for Breeders’ Cup races, no one is sure if her career will take her higher in the sport. She won the 1 1/16-mile race more than two lengths ahead of some fillies who’d had racing experience. This was also a race around two turns and at Keeneland, a difficult task for a first-time starter. Jockey Anthony Stephen, wearing orange and blue silks, and groom Jerry Dixon with War Eagle’s Love in the Keeneland paddock. Dr. Waldridge, an internal medicine specialist at Park Equine Hospital at Woodford in Versailles, Kentucky, volunteers as a veterinarian at Old Friends, a nonprofit retirement center providing a dignified retirement for Thoroughbreds whose racing and breeding careers have come to an end. 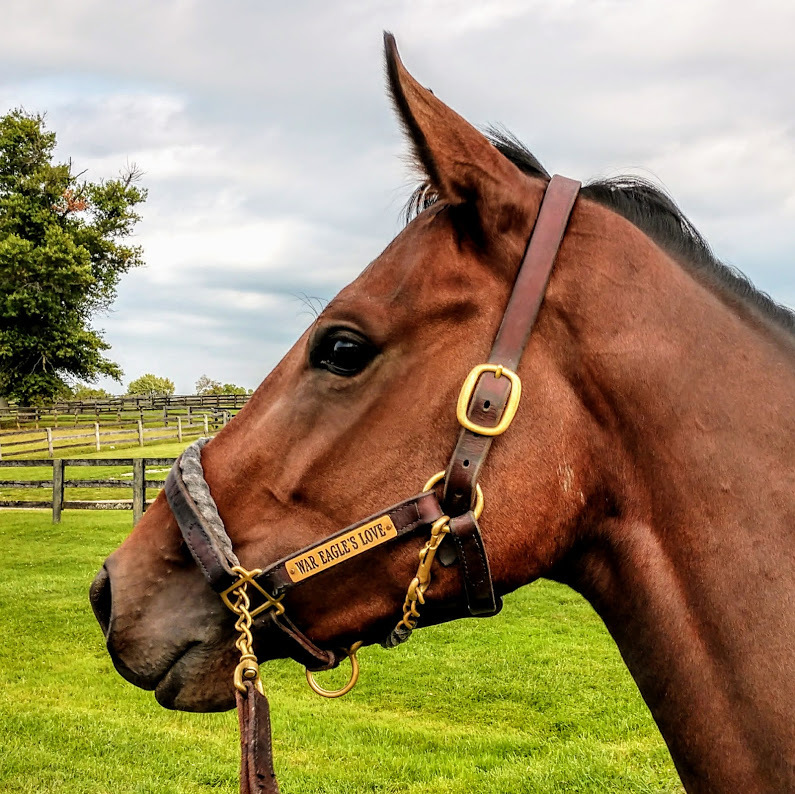 Founded in 2003 by former Boston Globe film critic Michael Blowen, Old Friends cares for more than 100 horses and is a living history museum of horse racing, attracting nearly 20,000 tourists annually. When the filly ran, she had an entourage from Old Friends Equine along with her connections. The filly’s trainer is Tim Wilson, farm manager at Old Friends, and a number of the nearly 40 people who crowded the winner’s circle for the filly’s win were staff and volunteers at Old Friends. The nickname came with the horse and is a reference to the filly’s sire, Birdstone, winner of the 2004 Belmont Stakes. Her breeder is philanthropist, socialite and racehorse owner Marylou Whitney who keeps her horses at Gainesway Farm. Ms. Whitney included a note with the filly’s registration papers that stated if she didn’t work out, then she would buy her back. Waldridge said he was surprised to acquire War Eagle’s Love last year, as he had been searching for an offspring of Birdstone. “My other racehorse was a Birdstone, so I decided to look for another during the sale,” he said. “Birdie had good confirmation and seemed to have a good temperament.